The Federal Reserve Bank of NY reported on Friday that repo fails for the week of September 20 were $359 billion (combined “to receive” plus “to deliver”). That’s the second highest weekly total of this year, following $435 billion fails recorded just two weeks earlier. The week in between those two was also high, tallying $325 billion. That makes for three consecutive weeks of unusually high repo fails. While most of the repo market operates in hidden spaces without much notice, one thing we can always depend upon is the correlation of repo fails with collateral problems. The occasional jump in fails had always plagued the repo market to some degree. A “fail” is pretty simple and straightforward; when the obligation of any seller to deliver agreed upon securities remains open following the close of business on the agreed date of the transaction. These are, after all, repurchase agreements, which means exactly what the name implies; I buy bonds from you today and agree to sell them back tomorrow (or whenever). If I don’t sell them back to you tomorrow, we have a fail. The reason for them relates to what repurchase agreements actually are; collateralized short-term loans, mostly overnight. They are structured as repurchases for historical reasons that since the 1980’s have been superseded by this reality. Despite the implementation of a “dynamic fails charge” in May 2009, fails have been occurring in UST’s especially the last three years with growing frequency. In a world of collateralized funding, as weird as it sounds there are times when that collateral is more dear or valuable than cash. Rehypothecation is one reason for that, as is the structure of securities lending more broadly. 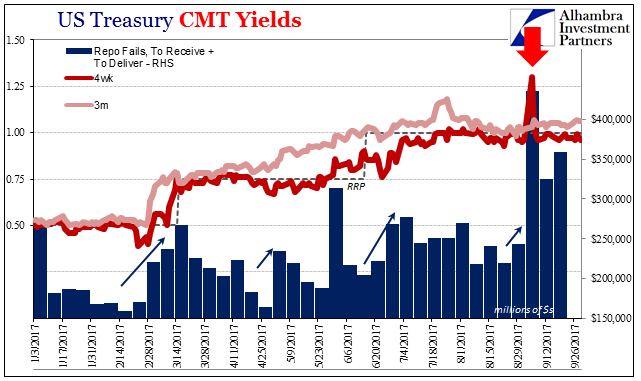 In 2008, this relationship was very easily established; T-bill rates in particular would trade in equivalent yield far less than they otherwise “should” given money substitutes (such as the IOER). 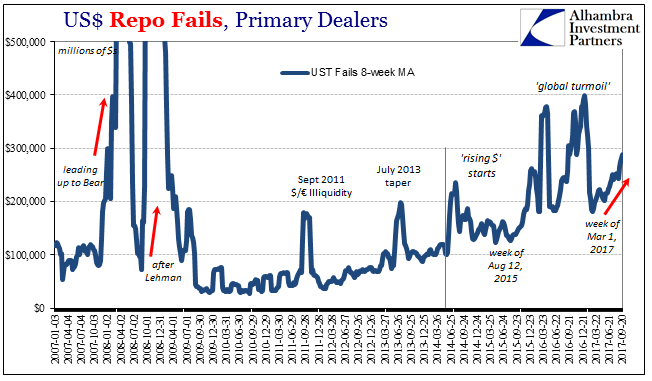 Bill rates fell sharply in the wake of Lehman’s insolvency, and repo fails exploded into what is now the textbook (well, one not written by an Economist, anyway) case. Thus, whenever we find an outbreak of fails it is for various reasons a tightening of collateral conditions. Some prove innocuous; most do not, especially any that would linger. For the repo market and collateral flow, it would seem September wasn’t very kind nor near enough of “reflation” enthusiasm. That condition appears to be continuing, too. Though the fails data is a week now two behind, there is every reason to suspect last week wasn’t much better and this week at the very least starts the same way. The equivalent yield for the 4-week bill remained below the RRP floor all five days, signaling a significant premium for pristine collateral is still being paid. At just 95 bps today, the yield was the lowest since late August. Exactly what it was that changed isn’t clear, though we have several suspects (Hong Kong, meaning China, meaning “dollars” likely FX). 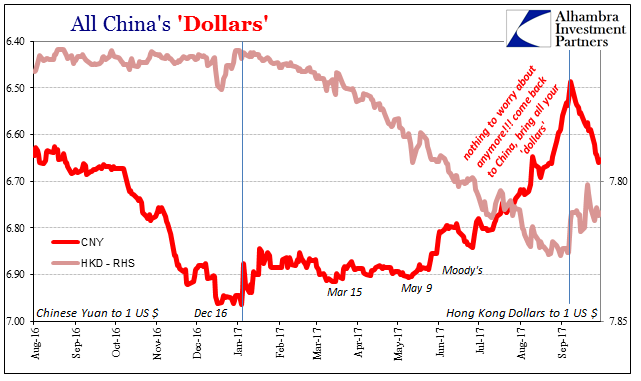 The surge in fails coincides with a whole regime change, starting with CNY. 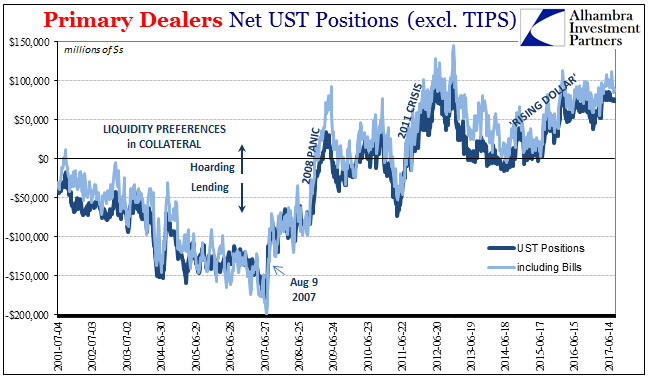 To go back a few weeks when the first big jump in fails was published, the significance of it was potentially as an escalating warning about systemic liquidity, collateral and otherwise. After all, if something unknown is clogging, removing, or just plain disrupting collateral flow it’s not likely to be an isolated case; and certainly not for three weeks running. The real question is what this all means, up to and including whether it marks like fails in June 2014 the start of whatever the next phase of eurodollar decay might be. We obviously won’t know anything like that for some time (and we have to be very careful about bias, meaning that since I suspect it, it’s easy to believe and see what I think is already there), but the biggest clue will be in escalating warnings like this. That’s really what the summer of 2014 was; from the first eruption in repo fails to oil to October 15, 2014 (collateral and Russia) to then junk bonds, rubles, and francs. By the time the Swiss National Bank broke the peg to the euro because of the “dollar” there was no longer any doubt. By that point, only an economist would believe the “rising dollar” was a good thing. Three weeks (and perhaps longer) simply confirms that this is some kind of warning. I’m hoping some of the less frequent monthly data will provide some answers, but unfortunately most of that won’t be available for some time (in the case of TIC, it won’t be released until November). Until then, we have to keep watching price movements for clues as to what kind of warning, possibly, this might be.